This technology review expresses the current view of the European Society of Gastrointestinal Endoscopy (ESGE) on the available techniques for intraductal biliopancreatic imaging. The three cholangioscopy techniques are described: the “dual-operator” and “single-operator” mother-baby approaches using dedicated instruments, and the “direct” technique using currently available ultrathin gastroscopes. The mother-baby method is standardized and reproducible, while direct cholangioscopy is technically demanding and its safety requires further evaluation. As well as direct visualization of the bile ducts, cholangioscopy has the further advantage of allowing targeted biopsy. 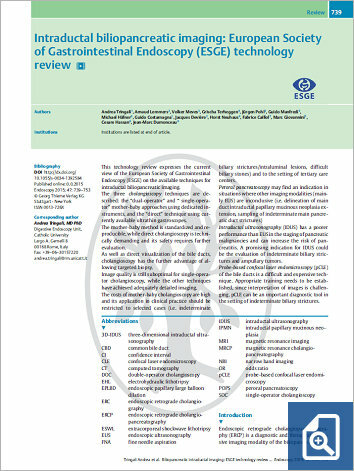 Image quality is still suboptimal for single-operator cholangioscopy, while the other techniques have achieved adequately detailed imaging. The costs of mother-baby cholangioscopy are high and its application in clinical practice should be restricted to selected cases (i.e. indeterminate biliary strictures/intraluminal lesions, difficult biliary stones) and to the setting of tertiary care centers. Peroral pancreatoscopy may find an indication in situations where other imaging modalities (mainly EUS) are inconclusive (i.e. delineation of main duct intraductal papillary mucinous neoplasia extension, sampling of indeterminate main pancreatic duct strictures). Intraductal ultrasonography (IDUS) has a poorer performance than EUS in the staging of pancreatic malignancies and can increase the risk of pancreatitis. A promising indication for IDUS could be the evaluation of indeterminate biliary strictures and ampullary tumors. Probe-based confocal laser endomicroscopy (pCLE) of the bile ducts is a difficult and expensive technique. Appropriate training needs to be established, since interpretation of images is challenging. pCLE can be an important diagnostic tool in the setting of indeterminate biliary strictures.